Made famous through her roles in a series of Woody Allen films in the 1970s, actress Diane Keaton’s celebrity helped popularise the menswear as womenswear phenomenon. She may not have pioneered this trend but she certainly made it famous, with Allen’s 1977 complicated romantic comedy Annie Hall the ultimate campaign. Hall, played by Keaton, held her own as she verbally sparred with difficult New York comedian Alvy Singer (Woody Allen). Hall’s laissez-faire attitude to relationships married well with her strong-headed sense of personal style – coordinated, pulled together, and with just the right amount of flair to pull off quirky extras like a man’s tie or wide-brimmed hat. "Woody’s direction was the same. Loosen up the dialogue. Forget the marks. Move around like a real person. Don’t make too much of the words, and wear what you want to wear. Wear what you want to wear? That was a first. So I did what Woody said: I wore what I wanted to wear, or, rather, I stole what I wanted to wear from cool-looking women on the streets of New York. Annie’s khaki pants, vests, and tie came from them. I stole the hat from Aurore Clément, Dean Tavoularis’s future wife, who showed up on the set of The Godfather: Part II one day wearing a man’s slouchy bolero pulled down low over her forehead. Aurore’s hat put the finishing touch on the so-called Annie Hall look. Aurore had style, but so did all the street-chic women livening up SoHo in the mid-seventies. They were the real costume designers of Annie Hall." According to Allen, "She [Keaton] came in and the costume lady on Annie Hall said, 'Tell her not to wear that. She can't wear that. It's so crazy.' And I said, 'Leave her. She's a genius. Let's just leave her alone, let her wear what she wants.'" – Woody Allen on Woody Allen. 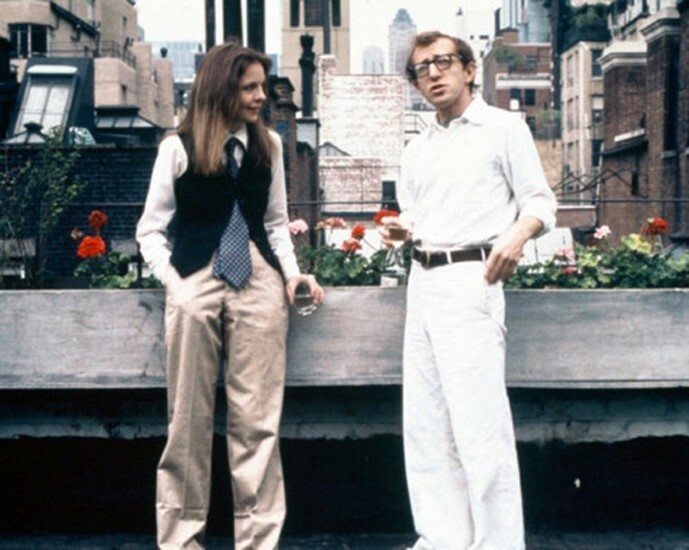 Ralph Lauren received costume credit in the film’s titles and Annie Hall’s iconic men’s tie, which was Ralph Lauren, resulted in the brand enjoying a massive spike in tie sales as women recreated the look. However, the daughter of Ruth Morley – the film’s costume designer – has since argued that there was actually very little Ralph Lauren clothing used in the film. Even so, the traditionally masculine tailoring touches and slightly oversized, boxy fit were in keeping with Ralph Lauren’s conceit of the day and definitive of a very specific mood, era, and Lower Manhattan location. Then Again by Diane Keaton is out now, published by Random House.